A revolutionary treatment has been used to save the life of a young Syrian refugee who suffers from a rare and terrible skin disease. The disease, which is called junctional epidermolysis bullosa (JEB), is estimated to affect only 0.37 people per million. Those who do have the incurable genetic condition, however, are often called “Butterfly Children” due to how their skin can blister, burn, and fall off at the slightest touch. Almost half of the children who are diagnosed with the condition do not make it past adolescence. 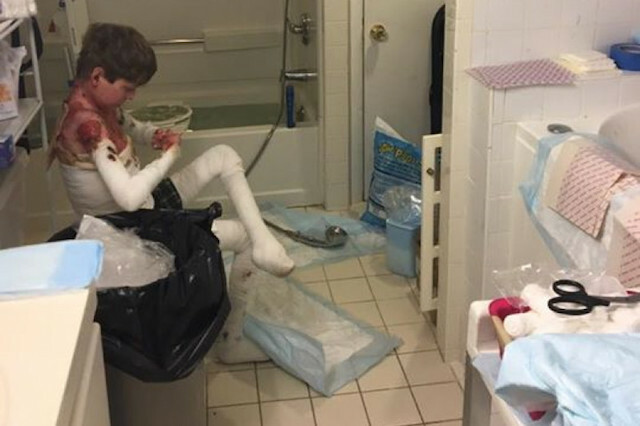 The 7-year-old patient in question, whose name was not released in order to protect his privacy, was first admitted to the Ruhr University Children’s Hospital in Bochum, Germany two years ago with blisters covering 80% of his body. Doctors tried treating the boy with antibiotics without any success. They also attempted using a skin sample from the boy’s father for a skin graft, but his body rejected it. With the boy struggling to hang on in such a “devastating” condition, physicians were sure he was going to die. In a last effort to save him, they reached out to Michele De Luca from the University of Modena and Reggio Emilia in Italy. De Luca and his team are renowned for using a specific kind of gene therapy technique to conduct two successful skin grafts in the past – but no one had ever attempted to graft as much skin as the boy needed to survive. Once the team agreed to take on the patient, they took a small sample of the boy’s healthy skin and found the broken gene that caused his JEB. After correcting the “LAMB3” mutation, they then used the sample to grow large sheets of skin similar to the kind that doctors use for burn patients. A few skin grafts later, the boy was released from the hospital in February 2016 following eight months in intensive care. A little over one year later, he is playing soccer like a normal kid. Though he still has small amounts of blistering on the non-grafted areas of his skin, he has no sign of scarring, due to how JEB only affects the outermost layer of the epidermis. It is unknown how his skin will fare in the future, but since De Luca’s two other skin graft are still healthy 12 years after their operations, he remains optimistic. Additionally, the treatment is extremely promising for curing other Butterfly Children of the nightmarish disease in the future. Clinical trials are reportedly now underway. “After this 10 years of struggling to accomplish all these rules and paperwork and bureaucracy, the moment you see a patient like this, you understand it was worth it to do it,” says De Luca in his report of the treatment published in Nature.